It is dental care provided to older adults involving the diagnosis, prevention, and treatment of problems associated with normal aging and age-related diseases. 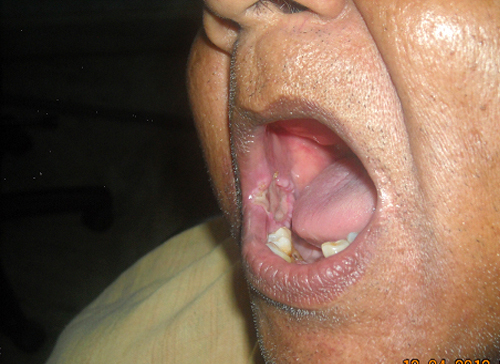 Since its difficult to mobilise such patients, We at thanjai dental centre carry out home visits, on request, where our team of doctors and nursing assistants provide consultation,minor dental procedures so that oral hygeine is improved which in turn improves their overall general health status. It is a speciality branch of dentistry where it not only corrects the position of your teeth if they are crooked or have gaps between them but can also improve your face profile by correcting disproportionate jaw relation ships or modifying and controlling facial growth. Orthodontics can be done for purely aesthetic reasons also as people are becoming more conscious and are looking for a perfect smile. For comprehensive orthodontic treatment, most commonly, metal wires are inserted into orthodontic brackets which can be made from stainless steel or a more aesthetic ceramic material. The wires interact with the brackets to move teeth into the desired positions. Tooth colored as well as transparent ceramic brackets have become very popular as they blend in with the tooth surface. *Other methods may include invisalign. Invisalign consists of clear plastic aligners that allow your teeth to realign without others seeing how your teeth are moving especially for those who are conscious of the metal wires being visible in the mouth when the conventional technique is used . 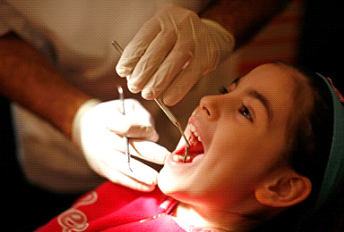 Pedodontics or child dentistry deals with treatment of the teeth and gums of children from birth through adolescence.It is important to establish a Dental Home for a child at an early age. The first dental visit is recommended around six months of eruption of the first tooth. Early detection is essential to maintain oral health, modify aberrant habits, and treat as needed and as simply as possible. Brushing and flossing alone cannot always get into all the pits in the teeth and the hard-to-reach areas in the mouth. Inadequate cleaning can cause food particles and plaque to accumulate and this can lead to tooth decay. Dental sealants are thin plastic coatings that are painted on the chewing surfaces of one or more teeth to avoid dental caries. They are more commonly applied to the back teeth; the molars and premolars. The liquid sealant becomes a hard, thin layer that forms a protective shield over the enamel of each tooth. This prevents food and plaque from getting caught and stuck within the depressions and grooves of the teeth. Children are the most obvious candidates for sealants. They should visit their dentists for sealant applications as soon as their molars and premolars erupt. This may remain effective for five years or more and can protect their teeth through the cavity-prone years of six to fourteen. Each person has unique needs. Adults at risk for caries and those without prior filings may also benefit from sealants. Though sealants can protect the teeth for years, they may need to be examined for chipping, wearing or breaking. They may be fixed and replaced by us as necessary. Visit THANJAI DENTAL CENTRE today and make your oral and dental health cavity-free. A dental implant is a ideal choice for replacement of extracted teeth unless contraindicated. It is actually a titanium post that is implanted into bone. It basically simulates the function of the root portion of the tooth. A crown, bridge, or denture is then placed over the implant to restore function and esthetics . Implants help reverse the negative impact of missing teeth in a variety of ways, restores and maintains the natural bite, prevents unnatural stress on the other teeth, keeps opposing teeth in their proper place, prevents tilting and shifting of adjacent teeth and enhances your smile, speech and chewing function. 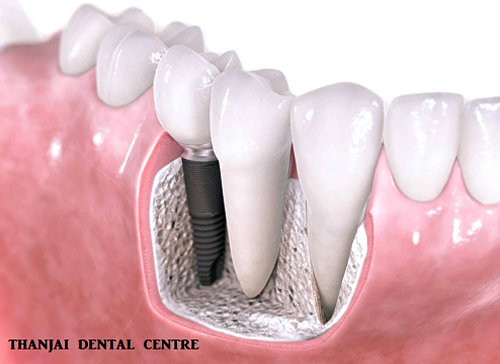 If you are with a single tooth missing or damaged, you will require only one dental implant to be placed with a crown. It is more like a natural tooth and root. If you are with many missing or damaged teeth, you will require the implant-supported bridges for replacement. Again, you will get all your missing teeth replaced with several teeth and necessary roots. If you have all your teeth missing, the dental implant-supported full bridge, mainly the full denture is going to be the perfect solution. Dental implants fixed in place of all your missing teeth would seem just similar to your original teeth and roots. Thanjai dental centre is a recognised IDA oral cancer detection centre.we conduct TUMOR board meeting regularly where our dedicated team which may include oncologists, surgeons and other clinicians meet ,for framing the protocol for treatment plan&discuss the progress of your treatment. Your personalized treatment plan combines advanced treatments with therapies that manage side effects, boost your energy and keep you strong during treatment. we regularly conduct oral cancer screening camps.and through IDA,we conduct anti-tobacco rally and campaign through schools &colleges, Our doctors work with you to develop a personalized treatment plan tailored to your unique needs and diagnosis. It is the process of rebuilding or restoring all of the teeth in the upper and lower jaw. A wide variety of procedures may be required in certain cases. Sleep dentistry, or sedation dentistry, is designed for patients who dread going to the dentist. Many people feel extremely anxious when they are placed in vulnerable positions like the dental chair. Sleep dentistry is an option for patients who fear dental procedures, fear needles, have difficulty with their gag reflex, have very sensitive teeth, or have difficulty becoming numb from oral injections. we offer pain-free and anxiety-free dental procedures as patients are in a deeply relaxed state, though fully responsive. Though in extreme cases, or for more complicated procedures, general anesthesia may be required, generally sleep dentistry involves conscious sedation which may include inhalation, intravenous, and intramuscular sedation. At Thanjai dental Centre , Dr. Rajmohan and his team uses the latest and most advanced laser dentistry technology to ensure a comfortable experience while maintaining your dental health. Laser dentistry is a very effective, treatment option for various dental procedures. Contact Dr. Rajmohan for more information and to see if this leading-edge dental technology is a suitable option for you!